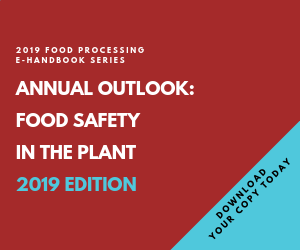 Under pressure to codify segments of the 2.5-year-old Food Safety Modernization Act (FSMA), the FDA on July 26 published two connected proposed rules "aimed at helping to ensure that imported food meets the same safety standards as food produced in the United States." The proposals are "Foreign Supplier Verification Programs for Importers of Food for Humans and Animals" and "Proposed Rule on Accreditation of Third-party Auditors." "Under the proposed rules, importers would be accountable for verifying that their foreign suppliers are implementing modern, prevention-oriented food safety practices and achieving the same level of food safety as domestic growers and processors," the agency said in a statement. "The FDA is also proposing rules to strengthen the quality, objectivity, and transparency of foreign food safety audits on which many food companies and importers currently rely to help manage the safety of their global food supply chains. "Under the proposed regulations for Foreign Supplier Verification Programs (FSVP), U.S. importers would, for the first time, have a clearly defined responsibility to verify that their suppliers produce food to meet U.S. food safety requirements. In general, importers would be required to have a plan for imported food, including identifying hazards associated with each food that are reasonably likely to occur. Importers would be required to conduct activities that provide adequate assurances that these identified hazards are being adequately controlled," the agency said. "FSMA also directs the FDA to establish a program for the Accreditation of Third-Party Auditors for imported food. Under this proposed rule, the FDA would recognize accreditation bodies based on certain criteria such as competency and impartiality. The accreditation bodies, which could be foreign government agencies or private companies, would in turn accredit third-party auditors to audit and issue certifications for foreign food facilities and food, under certain circumstances. "Importers will not generally be required to obtain certifications, but certifications may be used by the FDA to determine whether to admit certain imported food that poses a safety risk into the United States," the agency said. The two proposed rules are available for public comment for the next 120 days at http://go.usa.gov/j5xG. "The new measures respond to the challenges of food safety in today’s global food system," the agency said, noting imported food comes into the U.S. from about 150 different countries and accounts for about 15 percent of the U.S. food supply, including about 50 percent of the fresh fruits and 20 percent of the fresh vegetables consumed by Americans.